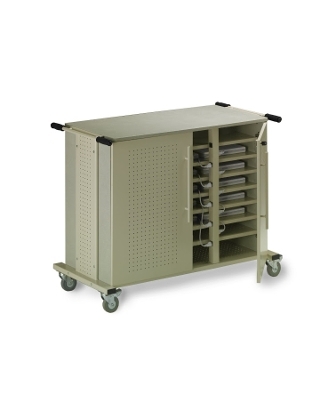 The Laptop Cart stores up to 24 laptops. The perforated steel doors and back panel provide proper ventilation. Two UL-listed multi-socket power strips with 24 outlets are included (timer not included). The shelves adjust on 1-1/4"H increments. Note: Electrical limitations require that each power strip be plugged into separate circuits, not just separate outlets. Stores and charges up to 24 laptops. Perforated steel doors and back panel provide proper ventilation.